Most of us hardly have time to have a proper breakfast on working days – we just grab something while rushing out to work or getting the children ready for school. We give little thought to planning a proper breakfast for the family or for ourselves – often neglecting it altogether. This may have long term bad consequences on our overall health, say experts. Why our body needs breakfast ? After going 9 to 12 hours without food during the night, our blood sugar levels drop. Studies have linked low blood sugar levels to poor memory, concentration and learning. Eating breakfast raises blood sugar levels and helps us to function more effectively. After the overnight fast, the body needs a rise in blood sugar to recharge the metabolism and get the brain and muscles into top gear. The trick is to eat food that does not cause a swift rise and fall in blood sugar levels, followed by a slump in energy and the desire to eat a sugary snack. In the mornings the body is low on energy reserves and needs food to get it going. Nutritionists recommend that breakfast should provide 25% of the daily nutritional requirements. People who miss breakfast miss out on many vital nutrients, which they are unlikely to make up for during the rest of the day. You can’t set the balance right by tucking in at other meals – the body is unable to process vital nutrients optimally if consumed all at once. Another reason for having breakfast is the kick-start it gives to the metabolism. After meals, there is a surge in oxygen uptake as food is digested and absorbed. During sleep the metabolism slows down, so eating soon after waking helps boost metabolism and gets the body going again. It gives that vital spurt of energy. Research has shown that skipping the first meal of the day may lead to an unhealthy pattern of snacking on high-fat foods throughout the morning. The person tends to go on a mid-morning binge and a craving for an early, calorie-packed lunch. They are ravenous by lunchtime and are a victim of the ‘gobble syndrome’ of speed eating. Experts say this is particularly bad for the stomach, as the secretion of digestive juices does not keep pace with the rapid food intake and this convulses the stomach. Eating fast, one also tends to overeat. Having a good breakfast is pivotal to staying in good health. Recently food experts at a conference in London discussed how to improve the breakfast habits of the British in an attempt to reverse the growing trend in obesity and allied risks of heart disease, diabetes and strokes. You need not stick to the cereal-toast-tea menu every day for breakfast. In fact, this menu, which is very common is not the ideal one. Processed cereal and toast contains high levels of simple carbohydrates which are converted rapidly into glucose. This produces a short energy boost followed by an energy slump and sugar craving. According to experts, if you have this kind of breakfast, you will probably start feeling hungry again very soon after eating. If you must have cereals, add some chopped fruits and nuts in it. You can also choose cereals with high levels of fiber and added vitamins and minerals. Breakfast cereals fortified with vitamins and minerals provide at least 25% of the daily requirement of essential vitamins and 17% of iron, according to nutritionists. Complex carbohydrates found in whole grains release their energy more slowly into the blood-stream. For this reason, porridge made of rolled oats and muesli is better than highly refined breakfast cereals like cornflakes. Porridge is good because there is an enzyme in oats which cuts cholesterol and heated oats are good for health. Bran flakes and muesli contain upto four times the fiber of luxury breakfast cereals and considerably less fat. The ideal muesli contains plenty of nuts and seeds which are rich in protein. Full-fat milk tastes better and contains more of the fat soluble vitamins A and D. Having too many carbohydrates for breakfast without anything to balance them makes people suffer from low blood sugar levels by mid morning. Start the day slowly with coffee or juice and the papers. Oats, whole grain breads and baked beans are among the ‘low glycaemic’ carbohydrates that result in a substantial but powerful release of insulin and steady blood sugar levels. This regulates the body’s bio-chemical harmony and improves mood and decision- making. A healthy breakfast should include at least one portion of fruit or vegetable. This gets fibre into the diet right at the beginning of the day. A glass of fruit juice is equivalent to one portion of fruit although it contains far higher amounts of sugar. A glass of vegetable juice is a healthy breakfast choice – the nutrients are beneficial, and since most people tend to eat far less vegetables than required, it is good to get them in juice form. A dash of chaat masala adds taste. Tomato, lauki, carrot and spinach juice are good options. Fruits and vegetables are major sources of antioxidants like vitamins A,C and E which protect against a variety of degenerative diseases. Recent research has shown that people who ate the most sugar, wheat, salt and caffeine at breakfast had the lowest energy levels throughout the day. Those who ate plenty of fruit and vegetables and drank lots of water were far more likely to feel fit, healthy and happy. As a rough guide breakfast should contain around 350-400 calories for women and 500 for men. Include protein in your breakfast in the form of eggs, bacon or ham (if you have them) or paneer or soya. A breakfast which includes proteins will release energy at a steady level for hours. According to experts, a breakfast that contains proteins as well as complex carbohydrates, beats anything else. Plain yoghurt is also very beneficial if had at breakfast. It is a good idea to grill the food rather than frying them. Have boiled eggs rather than an omlette. As for Indian breakfast, try roti instead of puris or parathas, with a green vegetable. You can make a healthy crunchy salad of sprouted green moong, chopped tomatoes, onions, cucumber etc with a dash of lime juice. Have a portion of fruit and a glass of buttermilk or lassi. Idli/dosa/upma are also good for breakfast provided you do not have a lot of coconut chutney along with them. As for tea and coffee, caffeine which is found in both stimulates the adrenal gland to produce the ‘fight or flight’ hormone adrenaline. An initial burst of get-up-and-go will swiftly be followed by fatigue as adrenaline production falls back to normal. Both tea and coffee are also mild diuretics so they cannot be counted towards the daily fluid intake. According to experts, tea consumption should be rationed if you want to stay alert in the morning. You can try herbal tea, green tea or fruit tea. Sip hydrated drinks, for example diluted fresh juice or lassi, buttermilk etc and drink lots of water. Pure water is ideal and adults who want to stay healthy should drink one and a half to two litres. 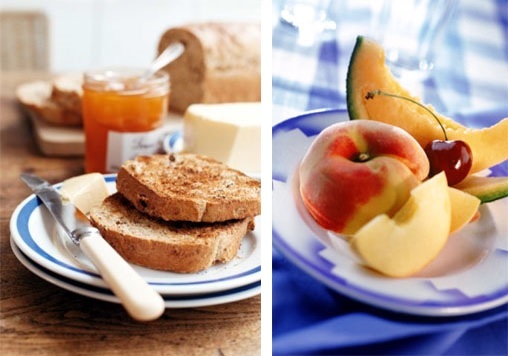 Breakfast helps in slimming: Contrary to popular belief, having a hearty breakfast helps to make you slimmer. A recent study published in the American Journal of Clinical Nutrition says breakfast eaters consume fewer calories during the day than those who skip this meal. Those who eat a regular breakfast are about 50% less likely to become overweight than those who don’t. And if they are slimming, they are more likely to keep the weight off. A research conducted in the Asia region found that young people aged 10-12 years who reported eating breakfast regularly were less likely to be overweight or obese than those who regularly skipped breakfast. Skipping breakfast makes it harder to lose weight and keep it off. Eating breakfast helps to kick-start your metabolism which is usually sluggish after a night of sleep. This also helps to balance food intake throughout the day, making over-eating less likely. Eating breakfast helps to develop a more positive attitude. It positively influences your morning mood and helps to reduce stress. A healthy breakfast gives you a good start to the day and keeps you fit and happy. People who eat breakfast are more likely to have more nutritionally balanced diets compared to those who miss breakfast. If you are feeling low, having a balanced breakfast regularly will pep you up. Breakfast has an important role in the mental performance of students. Studies have shown that children who skip breakfast are not efficient or alert in both mathematical and creative tasks. This is due to the fact that carbo-rich breakfast foods provide the brain with glucose – the preferred fuel of the brain. Hungry students don’t learn, say experts. A recent study evaluated the importance breakfast has on student performance in the areas of discipline, test scores and attitude. It found that breakfast helps reduce several of the common roadblocks to learning, including attention deficit caused by minor headaches and stomach aches related to hunger. Students who miss breakfast can disrupt the learning process in the classroom. When appetites improve, good behavior follows. The study also found that kid breakfast eaters are less likely to argue with teachers or fellow students and reported happier and more energetic during the school day. Thus the first meal of the day is extremely important. It not only helps us to kick-start our day with a spurt of energy and in a positive mood but also makes us feel much less tired at the end of the day. A little time and thought to the morning meal will pay rich dividends in the long run and make you feel like a new person altogether.